Watch from the flight deck of the USS Midway. The Midway reopens at 6:30 p.m. for flight deck “family picnic-style” viewing of the fireworks. Live entertainment, activities for the kids, flight simulators, food concessions and more. A Family Fun Fourth! For Tickets visit the Midway website for more details. The best views of fireworks are from the water! Get up as close as you can to the amazing Big Bay Boom Fireworks on board Hornblower’s July Fourth Dinner Cruises. Enjoy 3 hours on the yacht with a delicious buffet dinner, DJ entertainment and then move up to the sky deck for the amazing fireworks displays! 619-686-8715. Hornblower’s website has more details. 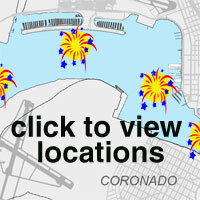 San Diego’s Fireworks show is going to light up the city this year! Enjoy the 4th of July by joining Flagship Cruises and Events on either their Star Spangled Dinner Cruise or the Fireworks Spectacular Spectator Cruise. Both cruises will be leaving from 990 N. Harbor Drive next to the USS Midway. To make a reservation go to Flagshipsd.com or call 619-522-6155. Happy Birthday America from everyone at Flagship Cruises & Events! Visit Flagshipsd.com for more details. FIREWORKS START AT 9 PM! 9:00 pm – Listen to Fireworks synchronized to music on the Radio. Contribute to the Armed Services YMCA charity to support the Big Bay Boom and the services for our military families and Wounded Warriors. The Port of San Diego’s Big Bay Boom July 4th Fireworks Show benefits the Armed Services YMCA’s family service programs for our military families including our wounded warriors at Naval Medical Center San Diego. San Diego has thousands of military personnel deployed and the families left behind often face specific challenges that the Armed Services YMCA helps them resolve.